Scientists doing comedy? You must be joking. Science Riot is an event series adapted from a popular UK program billed as "a thinking person's comedy night." We give local experts a crash course in standup then throw them on stage to deliver their comedy talk! Come to show your support as they talk to a room full of strangers for the first time ever. Want to see great amateur comedy and learn something new in the process? Get your tickets for our next show at the Field Museum below! 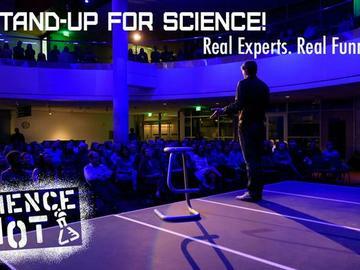 Give Science-Comedy a Home in Chicago! If you support scientists learning to make their talks more relatable and entertaining you can help to give this grassroots program a permanent home. All donations will ensure that this training is free and available for scientist participants in twelve new cities. Please consider contributing to our ongoing fundraising effort on Kickstarter, and share with everyone you know on facebook, twitter, or instagram! Time: Doors open at 7pm. 7-8pm lobby social hour. 8pm showtime. Please only use the West entrance doors for entry into this special event at the Field Museum. Drinks will be available for purchase in the West Lobby. This show is for adult audiences only. Tickets are expected to sell out in advance. Paid parking is available at Soldier Field's North Garage. Parking fee is generally $22 (special events at Soldier Field can cause prices to fluctuate) or you can use the SpotHero app. Please consider car-pooling or use public transportation (Roosevelt stop on the Green and Orange lines). Public bike racks are also available at the West Entrance.